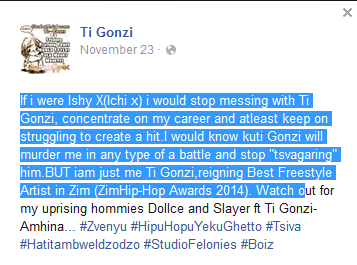 The rivalry between Ti Gonzi and Ishy X seems to be increasing. 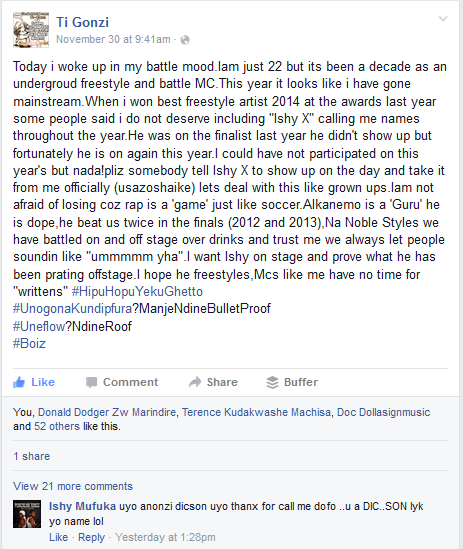 For those not in the know Ishy X and Ti Gonzi used to be labelmates once upon a time (yes, at #teamREHAB). Where the rivalry really stems from only the involved parties really know. In the past weeks they have been firing shot at each other on social networking site Facebook. Peep the screenshots below. Ishy X fired some shots on a Whatsapp group, most probably a Rehab one mentioning how he is hungry for a Ti Gonzi steak (for those that don't get the word play he said "Ti Gonzi" instead of "T-Bone"
Here Ti Gonzi mentions Ishy X's lack of a hit and gives him the pet name Ichi X. Who are you putting your money on? Whichever way this freestyle battle will be entertaining. As the awards date draws closer and closer we wait to see what shall become of this rivalry. For those wityh no idea of how the battle will be like I'll leave the first verses of the following tracks for you.